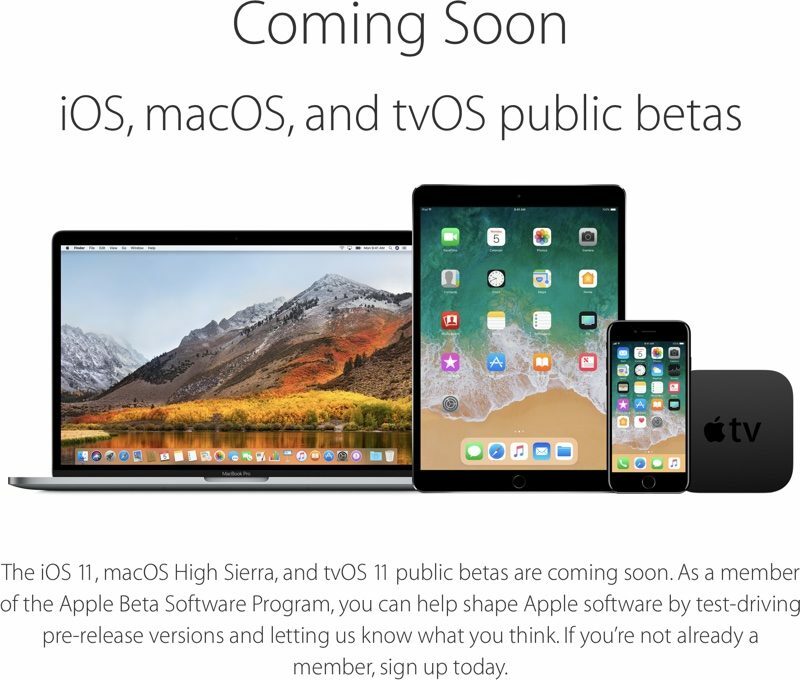 Apple today updated its Apple Beta Software Program website to announce that iOS 11, macOS High Sierra, and tvOS 11 public betas will be available for public beta testers in the near future. Apple has offered macOS and iOS public betas for several years now, giving non-developers a chance to try out new software features ahead of a public launch while also providing Apple with extra feedback, but tvOS is a new addition. For the first time, with tvOS 11, Apple plans to allow non-developers to install the beta software. To download the tvOS 11 beta, public beta testers will need to connect an Apple TV to a computer running iTunes using a USB-C cable. The tvOS software is then installed on the Apple TV using iTunes, with subsequent updates available over-the-air. The tricky installation requirements are likely the reason why previous tvOS betas haven't been made available publicly. It's not entirely clear when the tvOS beta will be made available to public beta testers, but during the keynote, Apple said iOS and macOS High Sierra would be available for public testers in late June, so that's presumably when the new public tvOS 11 beta will also be available. As for features, Apple has not yet detailed what's new in tvOS 11 and it received little coverage during the keynote event aside from the mention of a new Amazon Prime Video app that's coming to the Apple TV later this year. This lack of updates for TVOS is disturbing! Hold your excitement. No new features unless you count automatic light/dark switching one. Finally!!!! Always wondered why they made tvOS dev only. My guess is that they ran out of enthusiasm (again) for the product once it was clear that there wasn’t going to be bundled content deals. I’m really sad, because the Apple TV is probably the most used Apple product at home for us. He did say more news about tvOS was coming later. Anyone else notice that when they were talking about 4k and h.265. One of the examples they showed on screen was one of the tvOS screen savers?